“When a group of readers from diverse backgrounds sit round a table discussing a book, be prepared to hear differing opinions. 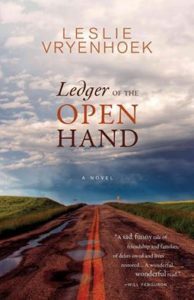 Yes, every one of us finished the book Ledger of the Open Hand by Leslie Vryenhoek. Some liked it and some didn’t. A few were ambivalent. Discussion questions ranged from why the author inserted certain characters where she did to whether the protagonists life “resolved” in the end near the water, throwing stones, her hand opened. Can a writer “steal” someone’s story? Can life stories be revealed without injury? Can relationships be balanced in the end much like spreadsheets and formulae. We disagreed. But man o man did we laugh! We laughed at our own stories. At our communities, families, and our lives. At a few choice sentences.